It sounds like the most delicious of all measuring tools, I know. Sadly this is not really the case. 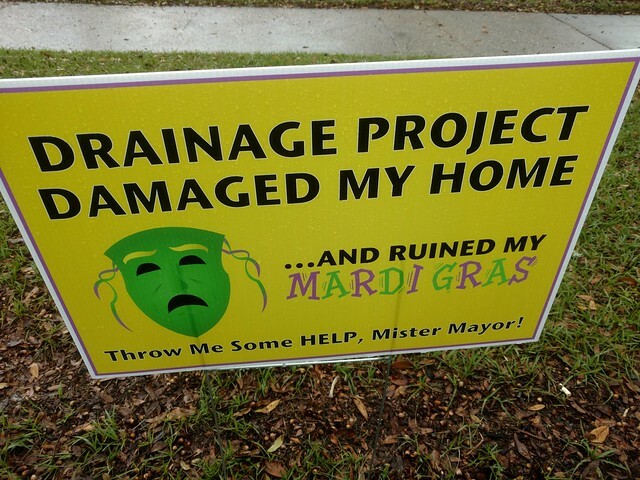 Potentially key evidence connecting Uptown drainage canal construction to nearby home and business damage was improperly withheld by the Sewerage &Water Board, according to a lawsuit filing from property owners seeking to recover their losses. An attorney for the Sewerage & Water Board argued in court Monday morning (Jan. 28) that the utility thought all of the evidence it had available was already handed over. The issue centers on a device called a piezometer, which is used to collect data on any groundwater level changes in the canal construction areas. Attorneys for Uptown homeowners and businesses in several separate lawsuits have contended construction impacts caused property damage, but that they have been constrained in their legal arguments because they lack certain geotechnical data -- such as groundwater changes and vibrations from heavy equipment -- they requested from the Sewerage & Water Board several times since 2016. The rest of this is about the legal technicalities of keeping the facts of one lawsuit separate from the procedures of other related lawsuits even when the cases are related and... look, the point is there are three or four suits pending against Sewerage and Water Board right now over damage done to buildings situated near the SELA work. It's why there are still signs like this Uptown near Napoleon Avenue. Good luck to everybody involved. Including S&WB, I guess, since they're still struggling to figure out how to pay for the badly needed drainage and water management work still to be done let alone pay out legal judgements that may go against them. This week, a task force report recommended they resolve this by imposing a new stormwater drainage fee. Currently, the S&WB's drainage system is paid for by property taxes, but the report calls for imposing a stormwater drainage fee that would account for how much water runs off a property. That would be attractive to S&WB officials because it would create an incentive for property owners to reduce the amount of water from their properties that makes its way into the drainage system. Various groups, both inside and outside city government and the S&WB, have argued for years that a drainage fee could be a solution that would bring in more money and could be imposed on government and nonprofit properties that are currently exempt from property taxes and therefore pay nothing for drainage. Philosophically speaking this seems like a bad direction to take. Basically it amounts to imposing a flat usage style fee on residents rather than addressing the fundamental regressivity borne by having so many special exemptions built into the tax system. Practically speaking, it makes sense that SWB members, city councilmembers, and the mayor would prefer the false "fairness" of the new fee rather than anything that challenges the privileges enjoyed by the churches and "charitable" non-profits who dot the local political landscape. Besides, apparently measuring how much water runs off of a particular property is easy. I think you can use a piezometer. Or something like it, anyway. Now figuring out how to get S&WB to bill people accurately for it. That's something else entirely.